One of the recent things in my life is that I’ve been developing a relationship with someone who shares an interest in being magical partners together. One aspect of this came up as a suggestion from my partner that we might have a sigil of some kind to represent the combination of our emergent effort. I’ve done some work in the past with bind-runes and sigils for imaginal landscapes, among other things; so I started to think about a kind of bind-rune with the initials of our magical names. 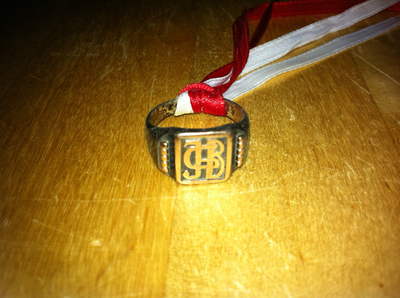 I was also reminded of the ring my father’s father had made in France during WWII that has the family initials on it. First, I created a series of images with the initials of our magical names arranged in different relationships with each other, arranging them in a variety of ways that seemed interesting to look at and different than the others. This was basically just a test file to see what I see in the shapes and their relationships. I think there’s some great possibilities there. I sent this to my partner also so she could gander as well as so we could talk about our Rorschach-like test results for these shapes; immediately I see stars in some, but lots of almost organic shapes, including the last which makes me think of a flower or rose and for which I added some colours to make the glyphs distinct in spite of much overlap. I also see ways that the Mem-Kappa can echo both the M(agdalene) and K(alokagathon) as well as the initials of our civil names K and G. But, from this there’s definitely some interesting shapes here to play with and work on! 1. I see a star in the middle. 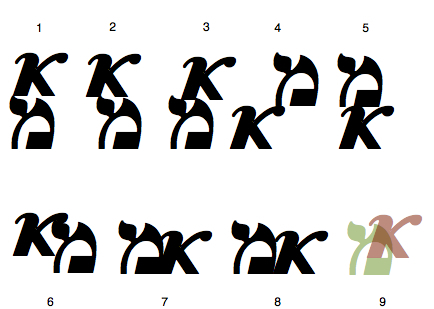 also the Mem at the bottom is like a partial top of a G glyph. K & G being our civil initials as well as Mem & Kappa being the initials of our magical names, in reverse order of our magical names. Of course, the sigil needn’t be so literal about these letter shapes, and could go more for a graphical lamen or waxen seal design, with symbolic elements; but this was an initial experiment. I sent the glyph study to my partner, and she send back what she saw in these relationships. My Roschach test is below… I’m trying not to look at your answers until I do mine so I’m not influenced! Oh my… I’m a bit off from what you saw!!! lol. I think its a great start. So, looking at some of the features we came up with from the glyph arrangements, I did some more work playing with the sigil idea as an inked-in pencil illustration as a draft of one possible sigil, but I think it turned out pretty good. I know the key and bee are derivative of The Magicians: A Novel, but it was in my mind associated with the two of us because that’s what we selected for our first bookclub selection. The rest of the illustration is of a Greek kappa and an Hebrew mem joined so that they form a five pointed star in the middle. Of course, “every man and every woman is a star” but also in Crowley’s star-sponge vision the relationships we form are also stars in their own right. Thus, I think the star in the middle is a reminder of both our individual sovereignty as well as what we are building together. For myself I like the idea of the bee actually facing down into the Kappa, like a descending dove, but also because the Kappa could be more of a flower. The Mem could be more keyhole shaped, or even could hint of a beehive. 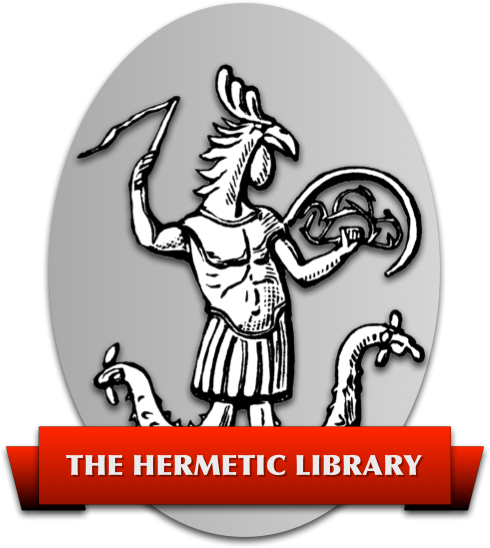 The key is intentionally but only slightly phallic, but I suppose there could be some detail for it to be more serpent like, as in a rising serpent. The kappa could be wider and less tall, and the star might be smaller. Also, I wonder if there’s a way to bring a square and a hexagram into this also, or if that’s too much. Another thought is that I’d like the sigil to be something that can be both very detailed and also something that can be quickly drawn, say as if next to initials or in place of initials on a guestbook or epistle. Further it’d be spiffy if there were an email version, some kind of emoticon. “BK*MF” might be too much of a stretch … maybe just “K*M” … or “M*K” … I kinda prefer the ordering Mem Kappa, but in the illustration the Kappa on top forms the star; of course, there’s no reason why it can’t be written “M*K” whatever the arrangement of the sigil. Also, I keep wondering what could be on the right side of the star … maybe that’s something for later? Well, it’s definitely a start, but with tweaks and more thought this could be pretty nice. One thought we had originally was to create some jewelry with our sigil on it. Certainly necklaces or something, but when I think about how I’ve actually used my grandfather’s ring as a wax seal, though the initials come out mirrored; I think about how having the eventual sigil as a wax seal would be pretty fantastic for using as part of magical operations, as well as the grand nostalgia from using the wax seal of our sigil on letters we might send each other. When this sigil, or another if we replace it, is far enough along; that’ll be a time to start exploring options for getting something custom-made for us using the design.